September is Illinois Wine Month! 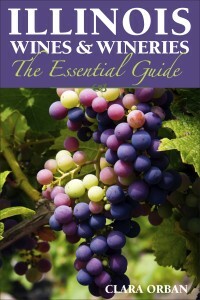 We can’t imagine a better way to celebrate than by giving away a couple copies of Illinois Wines and Wineries: The Essential Guide, a new book by Clara Orban. Comment here and tell us about your favorite winery. It doesn’t have to be in Illinois. We love our state’s wineries, but know that not everyone has had the opportunity to visit them (yet). To enter, comment by the end of the day on September 24th. Post this link to Twitter, or share our Facebook post, and you will be entered again. We’ll choose two lucky winners on Thursday, September 25. Good Luck! *We can only ship physical copies of the book within the U.S. Any international winners will receive an ebook. This entry was posted in giveaway, Illinois, Poetry, Regional, SIU by admin. Bookmark the permalink. My favorite winery is Hunter Valley in Cape Girardeau, Mo. In addition to good food and wine the people there are very friendly and obviously very interested in the making of their product. Chaumette Vineyards & Winery (Ste. Genevieve, MO) will probably always be my favorite. Now that I live in Kentucky, I rely on Huber’s Winery (Starlight, IN) and Old 502 Winery (Louisville, KY). I especially miss visiting Cave Vineyard (Ste. Genevieve) and Pomona Winery (Pomona, IL). Owl Creek is probably my favorite. I love the owls, as well as their treetop back patio. I also like Starview, with the outdoor music area and the pond. Both have good wines, too. My favorite winery is Alto Vineyards, Champaign. It is an offshoot of a parent winery in Alto Pass, of course, and founded here by the Renzaglia family. I am partial because the family patriarch, Guy Renzaglia, was a friend when he was on the faculty and I on the professional staff at SIU. Owl Creek is one of my favorite wineries. I love their ciders as well as their wines. I’ve not been to many of the wineries in Southern Illinois, but my vote goes to Alto Vineyards in Alto Pass. We were at the Saluki/SEMO game on September 13 and, while walking around the various tents, came upon Alto Vineyards’ tent. They were giving out samples of their wines. A gentleman on the other side of the tent was grilling brats and sausages. My husband ask to see a price list, and was told that they were free. A young man got us a brat with onions and peppers and we sat at one of their tables and ate. It was delicious. My husband had seconds. Their hospitality was fantastic! One of my favorite Illinois wineries/vineyards is the one next door! Sleepy Creek Vineyards in Fairmount, IL. It is a great place to visit and hang out. Great atmosphere, people, and wine! I vote for Chaumette in Missouri and Blue Sky in Illinois. Both have beautiful grounds, good food an great wine. Blue Sky’s “Mysterioso” is my favorite. In southern Illinois I enjoy Orlandini wines the best. They suit my palate, have a wonderful nose and good finish. Their late harvest is awesome!